When we moved to Latin America one of the things that we most looked forward to, in addition to living in a new country, was the opportunity to explore other countries in the region. In fact, one of the reasons that we chose to live in Central America was proximity and ease of access to other countries (whereas in South American one can spend 2 days on a bus just to get to another country). Bordering on 4 other countries (Mexico, Belize, El Salvador and Honduras for those that are a little behind on their Central American geography), Guatemala is a great base for exploring the region. Recently we took advantage of a long weekend to head to El Salvador. It turns out that our house to El Salvador is the same distance as New York to Boston, though the highways aren't quite as good and the scenery is better. Since El Salvador isn't very big (a little bit smaller than Massachusetts), one can really see a lot there in a short amount of time. And with 6,000 foot volcanic peaks within 45 minutes of beautiful beaches there is plenty to see. Driving through the wicker furniture capital of the region (we didn't get any despite Jed's attempts to convince Meg that it would definitely fit in the car and surely wouldn't pose any customs problems), we drove past the beautiful crater lake of Coatepeque en route to Santa Ana. When we were originally thinking about where to live in Latin America, Santa Ana had been high on our list of possible places. We decided on Guatemala early in our scouting trip and thus never had the chance to visit Santa Ana. After seeing Santa Ana we were happy that we'd decided to live in Xela instead. While Santa Ana is perfectly nice, it feels dirtier and more hectic than Xela without as big a colonial core or as picturesque surroundings. Then it was off to the coast, where we encountered a lovely beach resort at the end of a very long dirt road. Backed by a river and fronted by the ocean it was very beautiful and a great place to go for a kayak in the mangroves and boogy boarding in the ocean in the same day. If you're reading this blog entry then you probably already think that we're famous (largely because we're convinced that our mothers are the only ones that actually read this). But unless you are a television viewer in Guatemala or Latin America, you may not know the extent of our fame. As such, we thought we'd share a couple of experiences to demonstrate how we've worked ourselves into the Latin American cultural fabric. As a precursor, it is important to know that in Gutaemala, and Latin America generally, that sport is an essential element of culture. Anyone that has been to a Latin American sporting event or even been in Latin America during the soccer World Cup knows what a central role sports plays in everyday life. People are passionate about sports here- sometimes to an extreme, which results in things like soccer riots. If you haven't seen this first hand then trust us sports are more important here than in the US (when is the last time you heard of a baseball riot?). Also given their popularity, for many people television is the central means of watching sports. At any given time you can turn on the television here and find no less than a half-dozen soccer games on. And during playoff time even baseball makes the front page of the Guatemalan newspapers (even though all sports other than soccer are a VERY distant second in the hearts of sports fans). - First, watching sports you know on TV in a foreign language is pretty fun since they have some great terms for things; for example a homerun is "jonron" (which sounds exactly the same when pronounced in Spanish) and the right fielder is the "jardinero derecho", which literally translates as right gardener. - Second, for most US sports they simply take the US broadcast and add Spanish commentators doing voice overs. For the most part this means that they do what you probably did at home as kid when you were practicing to be a sports commentator: turn down the volume and talk over the real commentators. This means that you can often hear the US broadcasters in the background. It also means that often images on the screen have no relation to what the Spanish broadcasters are talking about, but relate solely to US broadcast commentary. Thus the Spanish language commentators (and viewers) are left to come up with their own explanation for why they are showing a replay of a game from 5 years ago or an image of a moose in the woods. - Third, for the most part and with the exception of special events (like the World Series), the Spanish "commentators" are sitting in their living room (or more likely a TV studio in Mexico or Atlanta), not at the actual game. This makes sense since the cost of deploying an entire broadcast team for each game would be prohibitive, especially when there isn't a big market for such games, and it allows them to show more games (since they can use the same commentators for a whole day of football games). But it does detract of the point of having commentators since the people in the studio have no better viewing perspective on the game than the viewers at home (and are often left with no explanation for something that has happened on the field). This means that the commentary tends to focus less on the action of the game and becomes more like the commentators having a conversation related to the particular game. Sometimes, especially during boring games, these conversations are very loosely related to the actual game on the field; such as the recent football game we were watching where the commentators engaged in a 10 minute conversation about the best NFL quarterbacks of all time while completely ignoring the action on the field (by the way, the answer was Joe Montana, who Latin American football broadcasters seem to be completely obsessed with- to the point that one time they even had Montana as a guest host, even though he speaks no Spanish whatsoever, which made for interesting television). Back to our fame and the American League Championship Series that we were watching on TV. From time to time, the commentators of the Yankees/Rangers game would give shout-outs to people watching at home. For example, they'd say things like "Hello to my friend Jose Gonzalez and his family who are watching this game from Monterrey". Towards the end of one of the games, at a key point when the outcome of the game was going to be decided, Meg (not being a Yankee fan) was nodding off when she heard the broadcasters say: "Queremos decir hola a Meg y Jed Herrmann en Guatemala; Neoyorquinos y fanaticos de Los Yankees que estan mirando el partido desde Guatemala, saludos Meg y Jed Herrmann" (translation: We want to say hello to Meg and Jed Herrmann in Guatemala; they are New Yorkers and Yankee fans watching this game from Guatemala, greetings to Meg and Jed Herrmann). Of course, it always great to get a shout out on international television, but is even more gratifying when you really get your wife's goat. First, Meg hasn't taken the Herrmann last name (it is unclear why anyone would turn down such a great name but she is very proud to be a Sullivan). Second, Meg isn't from New York (as she constantly reminds people) even though she's lived there for the majority of her post-college life. Third, Meg most certainly isn't a Yankees fan (in fact, she refused to allow me to even watch the Yankees-Twins division series with her). So now Meg is known as a Herrmann, New Yorker, and Yankees fan all across Latin America. Our second moment of fame did not have quite as broad an audience though since it concerns soccer the people who did hear were likely very dedicated fans. We went down to the pacific coast of Guatemala for the weekend and there was a Guatemalan league soccer game in the town. Our hometown team (the Xela Super Chivos, or Super Goats) was visiting so we thought it would be fun to go and cheer them on. Being visiting fans we thought it would be better to sit in the classy "club section" to avoid harassment (there aren't huge soccer riots in Guatemala but they still take their rooting pretty seriously) and because these fancy seats had a roof to shield the sun, which was well worth it since the game was played at noon when it was approximately 100 degrees (celsius, just kidding but it felt like it). It turns out that the club section as serves as the press box. Given that even local soccer games in Guatemala seem to be broadcast on multiple radio and TV channels, there were quite a few commentators with microphones there (though in an interesting reversal from US television broadcasts in Latin American, which we discussed above, these TV commentators don't have any monitors so they are literally just calling the game as they see it- since we were watching in person we can't say whether this makes for a better or worse TV broadcast than just sitting in the studio far away). When we arrived the game had just gotten underway and the only available seats were between two dueling sets of commentators. So we spent the whole first half with a pair of commentators screaming in one ear and a trio of commentators screaming in the other ear. We could have learned a lot soccer knowledge in theory but we couldn't really hear what either group was shouting about the game. At halftime, the trio of commentators introduced themselves and asked where we were from. We told them that we were from New York but living in Xela, which is why we were rooting for the Super Chivos (who were losing 1-0 at this point). We had a nice little chat with them. When they went back on the air at the beginning of the second half, they welcomed everyone back to the game "including our special visitors from New York City: Jed and Meg." Then he handed me the microphone (presumably for a welcome greeting) and I shouted "Go Super Chivos" to the viewers at home. Shortly into the half, the Xela team put in a substitute and we gave the player coming off the field a good cheer, leading the commentator to note "that our friends from New York are giving him a strong applause for a job well done". Also shortly into the half, the Super Chivos scored to even the game at 1-1 leading us to cheer very loudly. So, of course, 15 minutes later when the home team scored the commentators screamed especially loudly and directly at us "Gooooooooooooolll". In all, our second brush with fame was a little more personal than our first, even if the TV audience wasn't as big. It was also nice to meet the commentators (who at the end of the game told us a very long and not particularly funny joke about Guatemalans working in the US). We did note that the play-by-play guy who talked very fast in an exagerrated spanish accent during the game (think most words being said in the same tone as "Goooooolllllllllll") spoke in a perfectly normal and moderately paced Spanish when not doing his announcing (which must be a real relief to his family and friends since things like "Pleeeeeeaaaassssse passsssssssss the kettttt-chuppppppp" would probably get annoying on a daily basis). As a general rule, I think that when there is a half-marathon in the town that you live in and it costs $6 to enter that you sort of have to give it a shot, even if you're only partially in shape. Some may think "that sounds like a fun adventure" while others may be saying "that sounds like it is going to end in disaster". Well, both groups are partially correct though many would probably tip into the latter camp when hearing that Xela is at 8,500 feet above sea level and extremely hilly. But what resulted from the application of this rule was a (mostly) fun and uniquely Guatemalan experience. In fact, in many ways Medio-Maraton Los Altos is a good microcosm of life in Guatemala. Around 8:05am an announcement was made from one of the sponsor trucks, but we couldn't hear it as the other sponsor truck continued to blast music at top volume. Ten minutes later another announcement was made that we could actually hear (only because it happened to be at the closer of the two sponsor trucks not because the other truck turned down its music while the announcement was being made). The organizers informed us that "some people called from the highway and asked us to wait for them to start the race". So we waited (at this point Meg was already waiting at the rendezvous point we'd arranged at mile 3 of the course and wondering where all the runners were). Then at 8:30am the Guatemalan runners started to warm up (in hindsight we probably should have been suspicious about the race's start time when at 7:55am no one had started doing any warmups). Finally at 8:45am, the organizers (and at this point I'd already started to use that term loosely) directed people to line up on the starting line. A few minutes later, the women runners started (not sure why they decided that the 25 women runners needed a separate start). Then, finally, the 200 or so male runners took to the course. At this point, it became clear that the late start was not an aberration on the part of the race "organizers" but standard operating procedure (at this point it became clear that "organizers" wasn't the correct word to describe them). First, there were no course markings whatsoever (no signs, no race marshals pointing the way, nothing). While this was potentially very problematic (I pictured myself getting lost and ending up many miles outside of town), it worked out fine (for me) in the end as luckily I was running at a similar enough pace to others that there was always someone just in front of me leading the way. Finally, the good news is that I managed to finish the race in 1 hour and 24 minutes. For those of you that know anything about running, you'll note that is a world class time (just over 6 minute miles for 13 miles). This might make you suspicious about the actual length of the course- with good cause. In fact, by my estimation the "half-marathon" was at most 10 miles (making for a more reasonable 8 minute miles). I first became suspicious about the length of the race when I met Meg for the final time on the route. She encouraged me by saying that I was almost there, but one look at my watch convinced me that I was most assuredly not almost done with 13 miles. At this point, I had two thoughts: either this course isn't a full length half-marathon or we are about to run about 25 laps around the central park (where the finish line was). To be honest, I wasn't sure which option I preferred; while I wanted the satisfaction of completing a half-marathon, I was also pretty tired by this time and wasn't looking forward to 3-4 more miles. Another possible answer is that given the lack of any actual course markings or race marshals that one of the early runners decided to take a short cut and everyone in turn just followed (almost like a giant running version of the game telephone). With its grand aspirations, its delayed timing, its overall lack of organization, and its attitude of fun, care-free adventure, the half-marathon presents an analogy for life in Guatemala. Though I did read a few days later that the winners of the race were complaining that they had yet to receive their prize money from the "organizers" (perhaps also indicative of Guatemala). From Laredo, Texas, we crossed into Mexico (after a brief farewell visit with our friends at US Customs and Border Patrol), where we drove straight to Monterrey (no hanging out in border towns these days...). 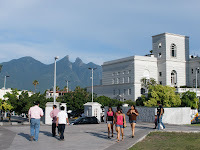 Monterrey is a very nice city with well designed system of parks, museums, and cultural buildings. There was clearly a significant amount of urban planning that went into Monterrey- most of it in the 1970s judging by the dominance of the concrete monolith in architecture. Then we passed through Zacatecas (a nice town with a good colonial core) before spending the night in Guadalajara. 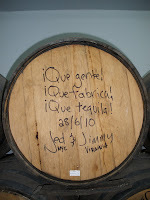 Then came the highlight of our time in Mexico: a visit to Tequila country. While we probably should have done more planning, we really just happened to head to the town of Atotonilco el Alto on whim. Atotonilco is the town where aged tequila was invented and is one of two main tequila producing towns in Mexico- the other being the town of Tequila. 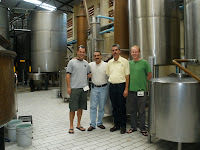 After some driving around we were lucky enough to end up at the distillery of 7 Leguas tequila. We ended up at 7 Leguas because it was the easiest to find, but it was a fortuitous choice. Though we hadn’t made a tour appointment, we ended up with a private tour of the distillery with Arturo Valle, the head chemist for the company. 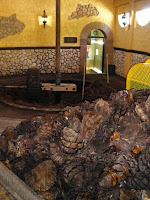 The tour consisted of visiting both of 7 Leguas factories, one of which produces tequila the old fashioned way, including using burros to crush the agave plants, and the other of which is a more modern plant. In contrast to our tour at the Maker’s Mark factory (which was a lot of fun), this was not a half hour canned tour with a script and a professional tour guide. At 7 Leguas we got an hour and a half tour from people who’s main job is to make great tequila and whom only give tours on occasion. And we got to see every step of the tequila making process- from tasting the agave plants to sticking our noses in the vat of tequila straight out of the still. It was fantastic! In all, we had a fantastic time at 7 Leguas, where we learned a lot about the tequila making process, got the royal treatment from the incredibly nice team at 7 Leguas, and got to enjoy a great tequila (don’t worry we took some bottles to go)! A big thank you to Juan, Arturo, and Berta for a great experience. We got a slow start from Nashville (due to World Cup soccer) so we decided to stop in Memphis for the night, instead of heading to Little Rock. And a good choice it was, as it is hard to beat a night of minor league baseball, great ribs, and a wander around Beale Street. In fact, we were even happier with our choice to sleep in Memphis when we stopped in Little Rock for lunch the next day and asked a local what there was to do in town and his response was “you’re pretty much doing it now”. If we had stayed in Little Rock longer, however, we could have watched the World Martial Arts Championships (though it is a little odd to drive into a strange town and see everyone walking down the street dressed in white martial arts outfits). An evening in Tulsa, where bar trivia was the highlight, checked Oklahoma off the list of US states to visit. On our way to the Texas/Mexico border we passed through some interesting places on our drive through Texas, including the town of West, which was an entirely Czech town (complete with a Czech bakery, a Czech Inn, and a biergarten)- as someone said: the Czechs were told to go west for greater opportunity and they took it literally. And in Manville, Texas, a record 11 water towers were visible from a single point on the highway. Next stop Mexico! After a lovely night at the Red Roof Inn Charleston-Highwayside, it was off to Tennessee via the land of Kentucky. The first stop in Kentucky was lunch in Lexington, a rather nice little town and birthplace of Mary Todd Lincoln; interestingly Abraham himself was born just down the road near Hodgenville, KY and also lived New Haven, KY as a child. I always thought as Lincoln being from Illinois- perhaps attributable to the fact that its license plates say as much- but it turns out he was originally from Kenucky- who knew? Another highlight in Kentucky was a visit to the heart of bourbon country. The Bardstown area is chock full of distilleries and we visited our friends at Maker’s Mark. We had a lovely tour where we learned about the secrets behind production (the use of red winter wheat rather than rye apparently produces a sweeter, smoother taste than most other bourbons). Thanks to the folks back at corporate headquarters (specifically one Andrew Slater), we got to experience the highlight of the tour: dipping a special “Founder’s” bottle of Maker’s Mark’s into its trademark wax. And since no trip to Kentucky is complete without at least one reference to the Kentucky Derby, we saw the house that was the inspiration for the song My Old Kentucky Home (the song that is sung before the Derby). Lets just say that the song is better than the house. Then it was back on the road and over the border into the Tennessee, where (thanks to our kind hosts the Greenes) we had a great night at the Honky Tonks on Broadway in Nashville. After 6 weeks back in the US, including trips to California, Maine, Connecticut, and Washington, DC for a wedding, a bachelor party, a reunion, a birthday party, respectively, it was nearly time to head the road again and head to Guatemala once and for all. After weeks of completing errands and working on logistics, the most time consuming being the purchase of car, and waiting for our nephew to be born (Devin Spencer Sullivan arrived on Friday, June 18), we had everything set to go. In this case, however, “go” meant different things for each of us. Go for Meg meant buying a plane ticket and getting a ride to LaGuardia airport. Go for Jed meant getting in the car and driving to Guatemala. As for the need to drive to Guatemala, we knew that we’d need a car there and after doing some car research while we were in Guatemala in early May, we determined that we could get a better deal on a better car in the US. So after much research and looking at used cars in 8 different states, we finally bought a Jeep Liberty, which checked off the boxes of not too big, not too fancy, but dependable and with four-wheel drive. Our last stop, before going to Guatemala was Jed’s brother’s wedding in Charlottesville, VA. Highlights of the weekend included a tasty southern style dinner on Friday night, followed by speeches and songs from family and friends; a beautiful outdoor ceremony in the garden of an historic inn; a great photo booth at the reception which captured many great memories and some less great ones; oh, and it was 95 degrees the entire weekend so there was some good sweating too. After some last minute car maintenance, Jed and his cousin Jimmy set off south towards Guatemala. The first stop was the “wild and wonderful” (that’s their state slogan) West Virginia. A night in Charleston contained many great sites and adventures; well, actually the only really great site was the capital building (its dome roof is covered in gold). To cut to the chase: We're moving to Guatemala! After 50+ meetings, in 3 countries, over the course of several weeks, we've found our ideal situation in Xela, Guatemala. If you had asked us 3 months ago what kind of place we wanted to live in Latin America, we would have described exactly Xela (or Quentzaltanango), Guatemala. Guatemala's second city, Xela is a medium-sized city of 300,000 with a large indigenous population, a beautiful colonial core, beautiful scenery, good restaurants and the full range of services anyone could want (see here for what Lonely Planet and Wikipedia have to say). On top of that, Meg has found her perfect job there. She'll be working as the Medical Coordinator for the Pop Wuj medical clinic. The clinic sees medically underserved local residents and is connected to the Pop Wuj Spanish School which supplies many volunteers from US medical schools. Officially Meg will be an employee of the Timmy Foundation, a US-based organization which organizes medical brigades of American doctors, medical students, and others that come to Guatemala for week long trips to provide intensive medical care to many of the underserved communities surrounding Xela. Jed also has some great opportunities consulting with Guatemala municipalities- a field he didn't even know existed 3 months ago! But there is actually quite a robust group of organizations that are working with Guatemalan cities and towns to better service delivery and improve transparency. So Jed can actually do work that is related to his work in New York City government, which means the last 6 years of working at the Department of Consumer Affairs isn't totally inapplicable (which is nice!). At present, Jed is planning to begin consulting with the Inter-American Development Bank starting this summer. In all, this is a great ending to what has been an amazing journey over the past 6 months. We're incredibly blessed to have seen so much of the world and to end up in as worthy a place as Guatemala. 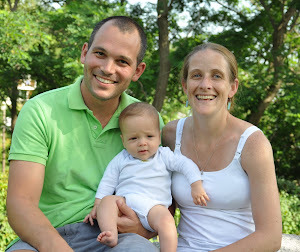 And stay tuned to our blog as we hope to give updates on our lives in Guatemala. Other than a brutal civil war (in which the US was intimately involved) and a variety of natural disasters (which the US had nothing to do with, we think), most Americans don’t know much about the recent history of El Salvador. In fact, when Meg’s contact with a rural clinic brought us to the country, we didn’t real know what to expect. We found a fun, beautiful, friendly, and modern country. Despite its small size (about that of Massachusetts), El Salvador has great geographical diversity. From the mountains and the beach to the cosmopolitan capital and cute colonial towns, El Salvador really has it all and all within a few hours drive. As we heard on multiple occasions, for Salvadorians a drive of over two hours is “a long drive”. We started our time in the country with several days of meetings in San Salvador; from people at the US embassy, US AID, NGOs, and more we met with many types of people. And almost universally we found them to friendly and forthcoming. As capital cities in Central America go, San Salvador is among the best (perhaps only Panama City might eclipse it). To those who know Central American capitals this might seem like faint praise, but found the city to be a pleasant, even if not particularly full of tourist sites (which may account for nearly complete absence of tourists). After San Salvador, the medical clinic we visited in the province of Morazan was a sudden change. The Morazan province is among the most rural in the country and although only a few hours from the capital, it feels very removed. The town where the clinic is has no electricity (though it is scheduled to receive power later this year) and limited running water. As such, the work that is performed at the La Estancia clinic is both impressive and much needed. After learning about the clinic from American volunteers and the local staff, we spent the night and soaked in the local culture in the town of 200 people. Morazan was also a rebel stronghold during El Salvador’s long civil war. Many of the families in the area escaped across the mountainous border to Honduras during the war while the men resisted the government forces. There are many reminders throughout the province of the war. Among them is the Revolutionary Museum in the town of Perquin. While it isn’t the world’s most interactive museum, the chance to see many remnants of the war firsthand with a former guerilla as a guide is worth the trip. After the mountains of Morazan, we headed down to the coast (with a short stop at the airport to change our flights- lopping our planned trip to Bolivia and Peru off our itinerary and replacing it with a return to Guatemala to investigate some more job leads). A night in the little beach town of El Zonte was a very pleasant experience. El Zonte is a small cluster of houses on lovely beach with a great surf break- all under an hour from San Salvador. While we probably won’t end up living in El Salvador (as we found better professional opportunities in Guatemala), we would highly recommend it for your next vacation. After a brief stop in the United States to do our laundry, do our taxes, see our families, take a break from our blog, attend Jed's brother's engagement party, go to Jed's cousin's christening, celebrate Meg's brother's birthday, and meet with some people at the State Department in Washington, DC (phew! In some ways our trip to the US was more parapetic than our trip around the world), it was off on a reconaissance mission to Latin America. As we've told people many times over the last months, our goal is to live in Latin America for a couple of years in a Spanish speaking country, where our work will be of public service, and which isn't too dangerous or unstable (sayonara Venezuela). 3. Namibia: There are certainly some well known sites in Namibia, like the iconic dunes at Sossusvlei, but it is a huge country with very few people and is much less traveled than its neighbor South Africa. Thus relatively speaking Namibia is a great way to get see all that Africa has to offer with less people, lower prices, and better beer than other places in the region. 1. The Pyramids, Egypt: Yes, they are crowded; yes, there are lots of touts; and they are one of the world’s original tourist sites. But there is a reason for this: they are truly remarkable. Their size, their perfect shape, their natural setting, their age… wow! 2. Safari in Tanzania: “Are you going safari?”; “You must see the animals while in Africa!”; etc… We heard all this and more about how great a safari was and how we must do it- turns out everyone was right. Seeing exotic animals in their (jaw-droppingly beautiful) natural setting is fantastic! 3. Cape Town, South Africa: This city is world-renowned and righltly so as it has it all: beautiful mountains, the ocean, good food, great wine. It is a wonderful place to spend a week. 4. Istanbul: Istanbul gets it right- the history, the mix of cultures, the energy, the architecture, the food. Again this is a place that people highly recommended to us and we’ll do the same- Istanbul is great! - Victoria Falls: After Niagara Falls, we didn’t have high expectations for another big waterfall. Turns out when you take away tourists and the barriers- allowing you to walk right up to the edge and even lean out over the falls (literally)- it is pretty awesome. renting car in Thailand allowing us to escape the hordes of tourists and find “the real Thailand"
3. Not changing money with scammers at the Malawi-Tanzania border: this reactionary move (see #2 above) cost us $50 since no else one in the entire world will exchange Malawian Kwacha (trust us, we asked in every subsequent country we went to). Hong Kong was a good transition between the rest of Southeast Asia and New York. With a diverse population, many familiar stores, and westernized prices, Hong Kong felt like a cross between Madison Avenue and Chinatown. The efficient transportation system makes Hong Kong a very easy place to spend a pleasant weekend. In fact, even Jed had to admit that Hong Kong’s public transit system was better than New York’s in many ways. With an integrated system of subways, buses, ferries, and street cars, the transit system is a model. Where New York has tried (though largely failed) to use its maritime assets (it was originally a harbor city for goodness sake), Hong Kong has succeeded; there are cheap, regular ferries that go all over the city. Hong Kong (as well as Bangkok) has engineered a very efficient way of transferring between subway lines. Rather than walking up or down stairs and all over the station (as one does in New York), they have set it up so subway lines between which travelers regularly transfer are across the platform from each other. This certainly is not that difficult an idea to think of, but it makes life a lot easier for the average rider. You have a close to perfection when you add a (very fast) direct train from the airport and the “Octopus Card”, a great stored value card that can be used on all public transport and many stores as well. While the logistical challenges are great, an Octopus card (we could call it the Hudson Card) would be great in NYC. Hong Kong also has great food assets. Like Singapore, the unique merging of many cultures has led to very tasty buffet. Jed tried to eat as many meals a day as possible to take advantage of all the culinary treats (despite great efforts, six meals in a day was the most he managed to fit in). And after a trip of shunning Chinese food in favor of local food, Meg was finally able to enjoy Chinese food without feeling guilty. Despite the fact that Hong Kong was shrouded in fog the entire time we were there (which is better than the sandstorm that had blown down from China a few weeks earlier), we still marveled at the fantastic scenic beauty of the place. The juxtaposition of green mountains towering over beautiful aqua water with skyscrapers sprouting in the foreground makes for a unique and fantastic visual fabric. However, it was the non-urban parts of Hong Kong that we found most invigorating. While the island of Hong Kong is the main urban center there are dozens of other smaller islands that make up the city. On Hong Kong island itself but also on the myriad of smaller surrounding islands, there is much untouched nature and many small towns and fishing villages. For example, we were able to take a 30 minute ferry ride and spend a few hours hiking around mountains and through small villages. And so with a long weekend in Hong Kong, our epic around-the-world honeymoon came to an anticlimactic end. Stayed tuned for the our awards for the best, the worst, and in betweens of the trip.